The impact of ILM Foundation’s programs is to apply “Intellect-Love-Mercy” into each effort. We practice a culture of providing Neighborly Needs in today’s new world. It is known as social responsibility, which can be considered as a more strategic form of charity for a more sustainable change. #ilovemercy: to tell us your story of “how you apply ‘Intellect-Love-Mercy’ in your work or daily lives.” Whether on Facebook, Twitter, or Instagram ~ Share Your Story with family, friends, and co-workers. Let’s Make a Difference! 3. Tell a brief story of how you use Intellect-Love-Mercy. Be sure to include the #ilovemercy hashtag. 4. You can also share a meaningful quote or meme with the hashtag #ilovemercy. 5. Encourage your community to donate here. Make sure you use the hashtag #ilovemercy, so we can follow your experiences ~ thank you. During this month of Black History, the ILM Foundation celebrates 20 Years of Service. So, we will begin a series of story-telling photographs on our Facebook pages. Each photo has captured a special ILM moment of people who have enjoyed doing this work. We have enjoyed so many moments while we were fasting and serving the homeless during Ramadan, community organizing for a social purpose, or building the moral character of urban youth and adults in South Los Angeles. We appreciate and acknowledge every volunteer’s commitment for charity. We would like to learn more about your experiences, and how volunteering has made a difference in your life ~ using Intellect-Love-Mercy. Please help us generate support for ILM’s work and introduce us to your friends and family. Encourage your community to “Make a Difference” and support ILM Foundation’s efforts. This mindful generosity will ensure our efforts impact. Help provide neighborly needs by sharing this campaign with family and friends. and let’s to begin understand each other even more. Thank You for An Opportunity to Learn! In 2018, we are celebrating 20 years since the Intellect-Love-Mercy Foundation was founded in 1998 by African American Muslims with the mission of “teaching life skills, to replace social ills.” It all started in 1987 with our very first event called International Family Day. 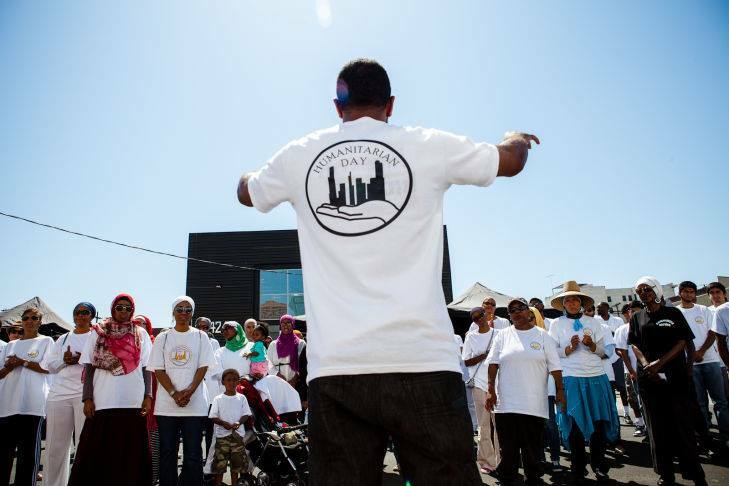 Masjid Ibaadillah was funded and given 30 days to organize a fragmented community of Southern California’s Muslims and its Interfaith community to enjoy a day of family-fun and education, at the Los Angeles Sports Arena. Out of this event came the acronym I.L.M. “ilm” is an Arabic word that closely means “knowledge,” but we converted its transliteration into the acronym Intellect-Love-Mercy. We are continuing this narrative today through Humanitarian Day, where we convert charity into advocacy for the homeless during the month of Ramadan. We Go Hard – with Go Beyond the G.A.M.E. ~ a football camp where life principles of Gratitude-Attitude-Motivation-Education are instilled into urban youth. The ILM Foundation is also a community organizer, based in South Los Angeles. ILM established the first local organizing committee in the Southern California Muslim community. See here how we are leading by teaching, Community Accountability. We are thankful that you have empowered us to provide Neighborly Needs to over 60,000 homeless, countless youth and adults, families, and organizations since 1998. Thank You for An Opportunity to Serve!